Hi all! Thanks for joining me today! This is the day of the Shibori Ribbon Blog Hop hosted by Tanya Goodwin of A Work in Progress. Tanya had some of the gorgeous Shibori ribbon which she decided to give to 6 beaders to play with. I was one of the lucky winners!! It was very exciting for me because I had been wanting to try some bead embroidery with the ribbon for some time. At first I was going to make a brooch but then I had another idea. So this is what I ended up with. A journal! 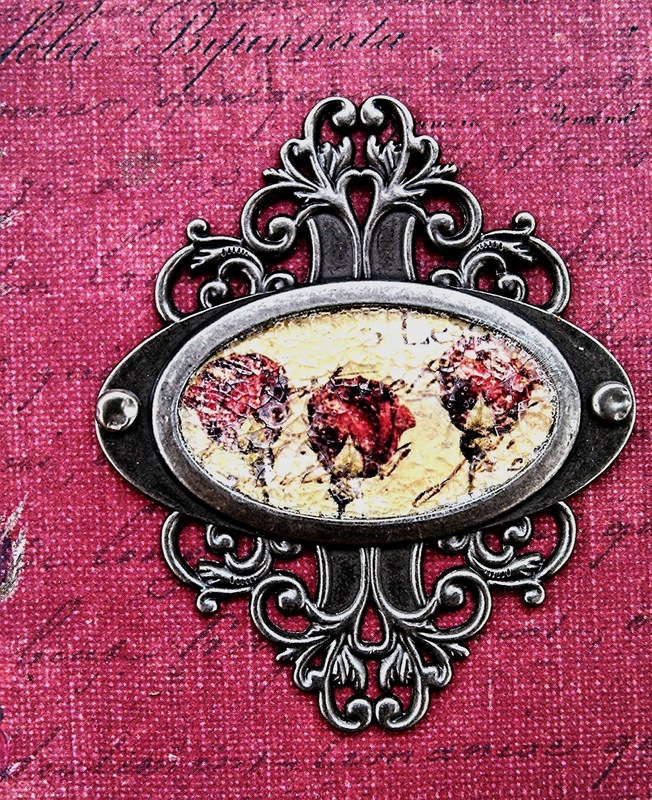 The way I got from a brooch to a journal was interesting! I thought a brooch would be fun but then I saw these Prima papers. The collection is called The Stationer's Desk. I fell in love with it. The colors are so rich and the designs are so interesting with pens, pencils, ink bottles, all the things a stationer would use incorporated into sprays of roses. I had been wanting to merge my beading with my paper for a long time and suddenly I had a way to bring the two together. The ribbon and the paper collection were a perfect match!! I decided to embroider a corner piece for the cover of a journal. I love seeing metal components being used on journal covers and I've thought bead embroidered components would work too! I realized I could use a Tim Holtz pen nib in the design and I had one that said journal on it! Everything was falling into place! I knew I was on the right path. give you a lot of commentary. I hope you visit Tanya's blog and hop over to the other blogs. What a great idea! Beautiful creation!! That was a great choice to use your ribbon as a corner decoration for a journal tying your two loves together. The ribbon is a great compliment to the paper they are both so rich in color. It is so beautiful, I love it. Lovely! I adore this journal and the shibori just fits perfectly. I had the same thing happen, it started as a neckpiece ended up a pin and now she is just calling to become a handbag. 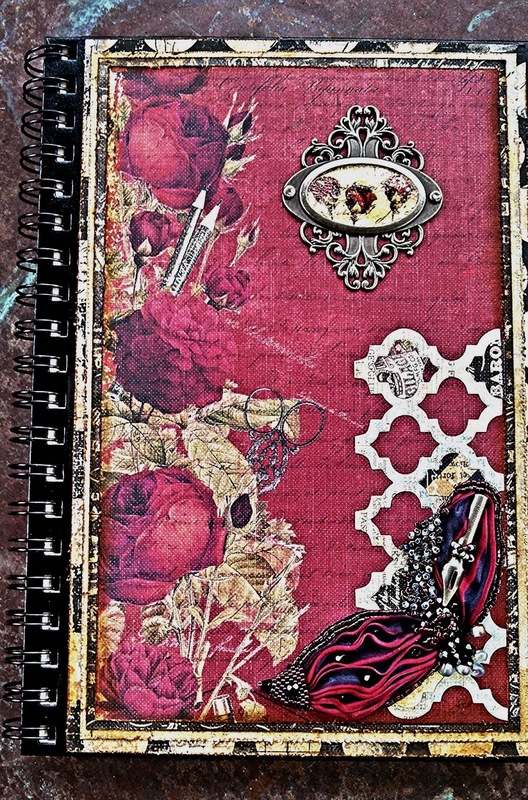 I love to decorate journals but this is a real stunner. Oh, that's gorgeous! I love the shibori embellishment and the beading is perfect. I love how all the metal, ribbon and paper make something so visually stunning. You made them all play so well together. I'm so glad you tried it and can't wait to see more. :) Thank you so much for playing! Oh wow! 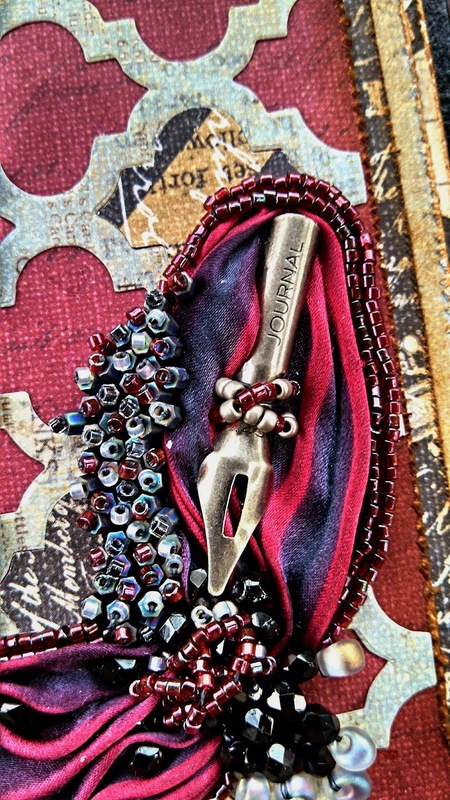 Just love the pen tip nestled in to that gorgeous ribbon. I love that it's not jewelry, too. A beautiful piece. Love how the ribbon just grows out of the paper as if it had always been there. What a brilliant idea!! I too wonder how to get beads in the pleats!! You did it so very well!! This is ingenious! Talk about "mixed media!" You must have been so excited to show this off--I know I would have been if I had thought to do something so creative! Finding the pin nub that said "Journal" must have been so thrilling! I love this! 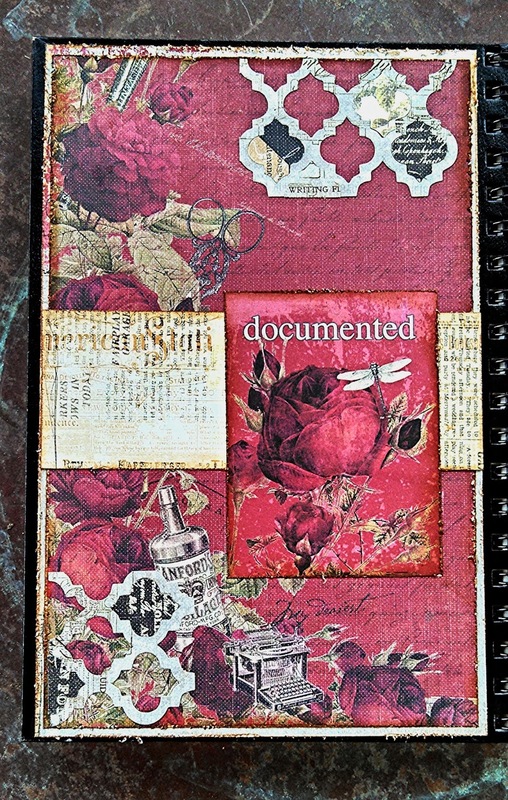 I am not typically a "red" person or a "rose" person, but I do love journals, and this is exquisite in all its details! Stunning craftsmanship. Can only imagine the delight of turning it over in my hands! Hi Maryanne! I hope your computer problems are fixed soon, too! And I can't even tell you how much I love your creative and gorgeous creation. 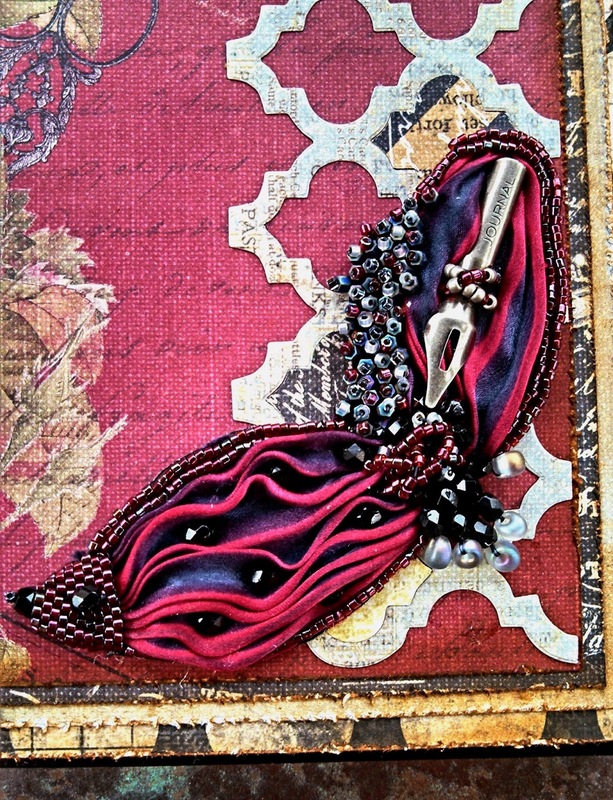 The deep jewel tones, your use of the ribbon and metal, and your entire design is absolutely beautiful! What a brilliant idea! I love journals, and that gorgeous ribbon, paired with the pen nib is just too cool! i am enjoying visiting all the sites and seeing what folks are doing with the ribbon i dye. so many things to wonder about! it's great to see it used on a journal. thanks for sharing it. You are amazing!!!! An expert in mixing media with amazing results!!! This is gorgeous, you incorporated the ribbon so perfectly! Hi Maryanne :-)......this is fabulous. I love the amazing background pages and journalling. The beading and ribbons are stunning. You have such a great eye........awesome journal page. The colours that you have used are stunning, so vibrant and full of life. There is so much texture and depth with your designs, my craft is jewellery making and I can appreciate the amount of work that has gone into this work.